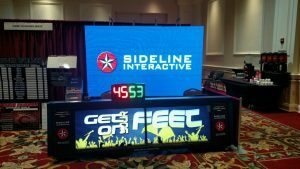 Click on the video to see Jay Gifford, Athletic Director at Dodge City High School, Kansas, talks about fundraising on their seamless 30ft PRO-LED scoring table from Sideline Interactive. Jay has been very happy about how easy the table has been to run, the performance and quality of the ALL STEEL scoring table frame, and how easy it has been to fundraise with. Dodge City High livestreams all their games with the 30ft LED scoring table as the main spot for advertising to game audience and home viewers. Get a free quote and more information by filling out the form below.